Every so often, Heroes of the Storm will bring in a new story to the game, told solely through its skins. Previously, that happened with Star Princess Li-Ming and Space Lord Leoric, Heroes of the Storm’s own mini space opera about a magical girl and evil space tyrant who is definitely not similar to Darth Vader, at all. Now it has a new story: Heroes Mecha Storm, with its very own over-the-top fight sequence, as seen in the trailer above. In case you need more free games to play, we have a list of the best free games on PC. Like something you might have watched on a Saturday morning, it’s a fight between robots on a giant alien spaceship for the fate of Neo Stormwind, complete with a totally radical guitar riff. It’s been made to show off the three new skins coming with this story and event: Mecha Rehgar, Mecha Tyrael, and Xenotech Abathur. In it, you can see both of Abathur’s ultimate abilities, plus one from both Tyrael and Rehgar. It’s genuinely very good as a fight sequence and as a way to promote the three new skins. Each of those skins has a pair of recolours: the two good guys, Rehgar and Tyrael, having dark recolours (as in the end of the trailer); while Abathur has a more toxic green variant in case you like the idea of a poisonous alien slug robot. These aren’t the first Mecha skins in the game, with D.Haka being a mechanical parody of D.Va for Dehaka, and Mecha Tassadar being one of the oldest skins in the game. Because of how popular Abathur, Tyrael, and Rehgar are, plus how well they fit the theme, they’ve been given the Mecha treatment, although there are apparently some more “juicy ideas” in the pipeline. That quote comes from Theodore Park, lead character artist for Heroes of the Storm. There’s also more to come with regards to themed skins according to Park, as there are plans to explore more universes with skins, in a similar way to League of Legends’ Project series. More magical girl skins, please. 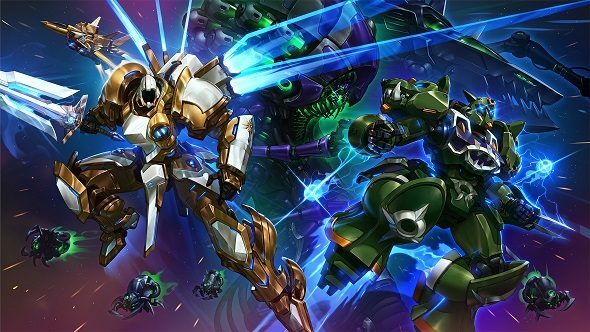 The Mecha Tyrael, Mecha Rehgar, and Xenotech Abathur skins will be available tonight in Heroes of the Storm, briefly after this trailer goes live. As they’re legendary skins, they’ll either cost 1,600 or 2,400 shards each, with a bundle of them likely to be available too, for the real-money gem currency.